The size of this version is similar to a dime for your reference. A new twist on the symbol of peace. 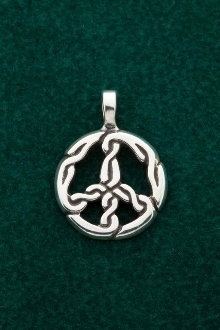 Much of Celtic knot work portrays the eternal natures of life. This original design shows humanities infinite desire for peace. This design is a part of the "World Celtic" collection. The peace symbol is a decidedly western image of the 60's, promoting peaceful non-violnent protest against injustice in the world. This iconic symbol has been at long last enjoying a modern renaissance. Crafting this image in a celtic artistic format is in honor of the unification principals of knotwork as a whole. New paradigms are needed in the structure of modern celtic symbolism, and this design is emblematic of the marriage of celtic with western cultural imagery.